Clasp/Buckle: 18K yellow gold Rolex deployant clasp stamped "6 S" and "7206"
The present timepiece is an extremely attractive example of how the Day-Date is used to express all of the unbridled creativity of the Rolex design department. 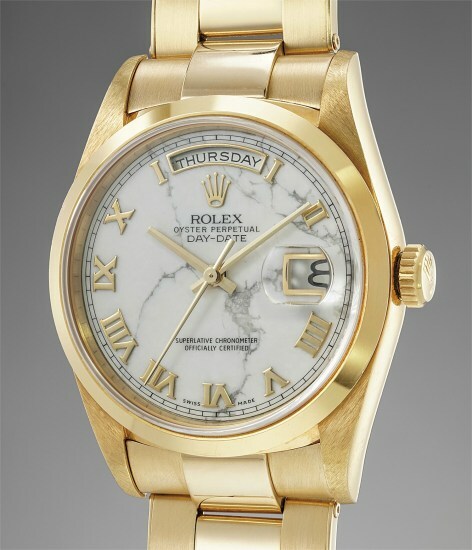 The quintessential “luxury” Rolex timepiece, the Day-Date (and earlier, its sibling the Datejust) were conceived in the mid twentieth century as the most luxurious offering in the Rolex lineup. In fact, the President and Jubilee bracelets were originally created specifically for these two models and were intended to emphasize the luxury connotation of the watches. Over the years, Rolex created an astoundingly varied series of dials for these pieces, such as dials in malachite, wood, coral, fossil, lacquer, and so on. One of the most unusual, rare and attractive iteration is indeed the one exemplified here: a dial realized with a very thin slab of marble, a material hardly ever used as a dial medium. Fresh to the market and in superlative condition - unpolished and still retaining its original green Rolex sticker to the back - the present piece is a remarkable testament to Rolex’s creativity and design boldness, and one of the most collectible Day-Date iterations known. It is furthermore accompanied by its original guarantee and presentation box.